Emerald software tools provide project management utilizing a system component configuration window to manage all the drives, I/O devices and files used in an automation system. 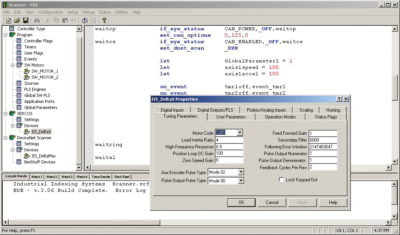 The EDE program code editor is content sensitive and easy to use. The Emerald Motion Language (EML) is a straight forward language that uses a standard structure with mature functions tailored to the real-time aspects of motion control. The EDE provides a debugging window for program development support. Watch data values, trace the program flow and view network device status in real-time. Menus from the configuration window allow you to select and configure all the devices in your system for fast and easy setup. 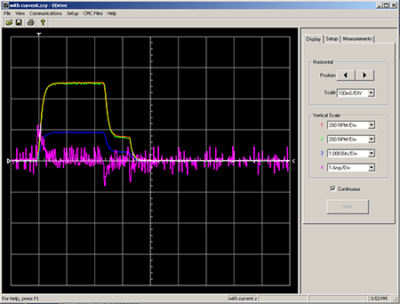 Two software tools are available for setup and tuning the motor-drive system. ShanX for the SERCOS III Toshiba drives and eDrive for the SERCOS II Emerald series drives. Real-time scope functions display the motor velocity and torque responses to assure the required motor response is achieved. Once the motor and the drive are installed you can fine tune the motor’s response by adjusting the servo loop parameters for maximum performance.